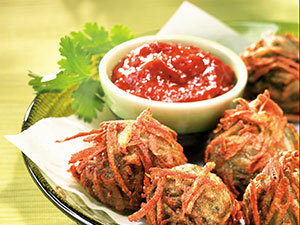 India boasts a culinary heritage of vegan dishes with flavorful combinations of legumes, vegetables and spices. At Desert Valley Medical Center in California, Ryan Gunthner gives an all-American favorite, fried potatoes, an Indian twist. He forms shredded potatoes, spinach and aromatics into canoe-shaped tikki, then deep-fries them and serves the dish as an entree or side with a spicy ketchup. 1. For spicy ketchup: In deep skillet, toast spices in oil until fragrant. Add onion, garlic and ginger and cook until brown. Add ketchup and simmer for 10 minutes. Let cool slightly and puree in food processor. 2. For tikki: In clean food processor container, puree spinach, peas, green chili, spices, salt and cornstarch. 3. Fold mixture into shredded potatoes and add vegetable base and baking powder. 4. Form 1-ounce balls into tikki (canoe shape) by hand; chill. 5. Heat oil in deep fryer to 350 F. Deep-fry tikki until slightly past golden brown. Serve with spicy ketchup or mango chutney.